DeciBel Architecture has revealed its design for what could become Melbourne's tallest skyscraper, a skinny 330-metre-high tower rising from a triangular plot. 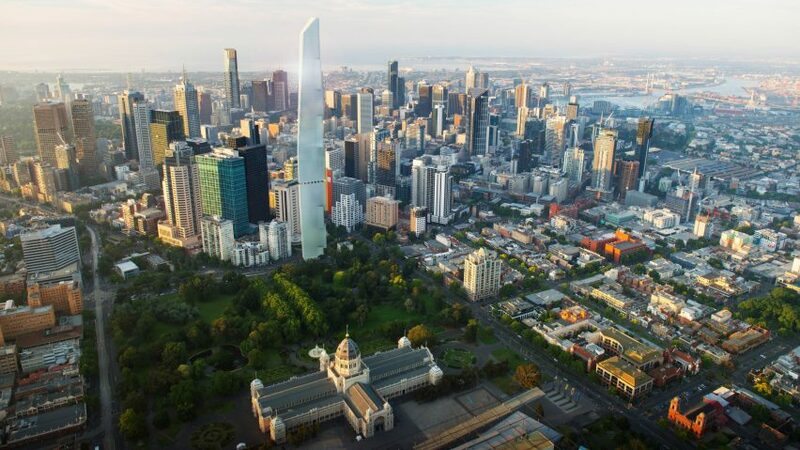 Proposed for an angled plot just half the size of a tennis court, the Magic tower would be the tallest building in the city, outstripping the 297.3-metre Eureka tower. The design has been submitted for planning and if approved could be built as early as 2022. Due to its shape, its slenderness ratio would be "off the charts" DeciBel Architecture founder Dylan Brady told Dezeen. "The current slenderest is in New York City, at around 22/23:1. If we were a rectangle we would sit at 18:1, but as we are a triangle with an effective width of 12.4 metres, our slenderness ratio pushes into around 26.6:1," he said. New York City currently has the monopoly on tall and slim towers. Rafael Viñoly Architects recently completed a 425-metre skinny tower in Manhattan, which has open floors to allow the wind through, while Meganom has plans to build a 305-metre residential skyscraper with an aluminium and glass facade. To fit the narrow site and still go as tall as possible, DeciBel Architecture added multiple rotations to the tower's design. "Tall buildings need their centre of rotation to be as close to the centre of mass as possible – our triangular shape has led to some very interesting tuning and innovation," explained Brady. 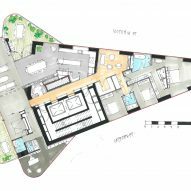 "As with any tall building, wind rules, and we have a series of open floors through the tower to allow for plant and for the wind perforation and confusion to occur. The western end of the tower is stepped, to detach laminar flows, and the eastern end is tapered, reducing load along the edge," he added. "We have allowed for an innovative new type of mass damper near the top of the building, developed here in Victoria, to gravity nail the upper reaches and reduce the sway." Both the core and perimeter would be made from concrete, using cutting-edge construction technology. "We have some of the most innovative technology in the world in Victoria to do this, and our construction and developer partner invented the Lubeca system responsible for jumping cores on most of the tall buildings in the world," said Brady. Australian developer Grocon plans to divert most of the profits from selling apartments in the 60-storey tower to an endowment fund for science institution the Royal Society of Victoria (RSV), with profits for investors capped at a minimum rate. Prior to commissioning designs for a building on the site, the RSV used the plot to host a weather observation facility. As well as testing the limits in terms of height and slenderness with the Magic tower, Decibel Architects hope to push the envelope in terms of sustainable design, partly to benefit the RSV. The northern and wester sides of the tower would be fitted with solar panels that could power the entire building, along with oversupply that could be used by RSV facilities. Rainwater would be caught from the facade and stored for use by the building. Melbourne is also about to get a tower by Zaha Hadid Architects, a 64-metre-high apartment block complete with curving balconies and a pair of rooftop pools. Questions still hang over whether the city will get a Foster + Partners project in the form of an Apple flagship store for its Federation Square, after protests from residents saw the plans go to the Victoria state parliament.